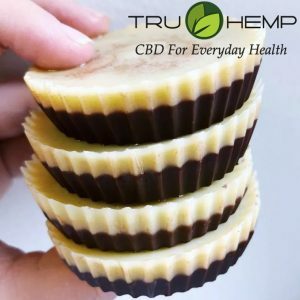 These 4 ingredient CBD cups are a great way to add CBD into your daily routine and are a delicious treat. They can absolutely be made without the CBD too. They are not sweet and the option to add maple syrup or raw honey is completely up to you. Using a CBD tincure like TruHemp CBD oil, is the easiest. I added melted coconut oil and cacao powder to a bowl and added them to a muffin tin. Then I added in 1/2 tsp. of TruHemp CBD tincture to each muffin tin. It is better to microdose each cup individually rather than adding the CBD oil directly to the cacao powder. This will ensure that all of the cups have the same amount of CBD and one does not have more or less than the other! After they have cooled in the refrigerator, add the melted coconut butter. In a bowl, melt the coconut oil and then whisk in the cacao powder so no lumps remain. If you choose to add a sweetener, add it to the coconut oil & cacao mixture. Once the cacao is fully mixed in with the oil, use a 1/4 cup measuring spoon to evenly distribute it among the muffin tin. It should fill 6-8 liners. Then add 1/2 tsp. of CBD oil to each muffin tin and stir to combine with the cacao and coconut oil. Place the muffin tin in the refrigerator for 30 minutes to cool. In a bowl, melt the coconut butter. Remove the muffin tin from the refrigerator and work very quickly to top each cacao muffin filling with 1 Tbsp. of coconut butter. The cacao and coconut oil will begin to melt and you want to ensure that the coconut butter remains on top of it, so fill the muffin tin quickly and return it to the refrigerator to set for 30 more minutes. Once the ingredients have all cooled, remove from the muffin tin and enjoy. Store in the freezer until you are ready to eat them. You have the option to leave the CBD out of the recipe and just enjoy keto cacao-coconut cups.